Steampunk - the popular look inspired by the Age of Steam and the Victorian era, rooted in that era's styles in fashion, culture and art - from the nautical to the industrial. 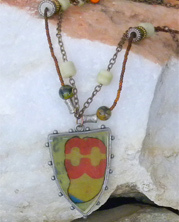 Large industrial style bezel ornament with layered yellow and amber beaded necklace and chain. 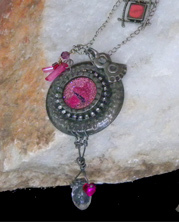 Pink industrial charm matched with chain and smaller dangles. 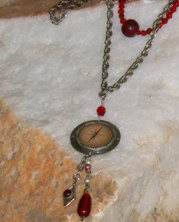 Metal compass charm with red dangles has a nautical feel. 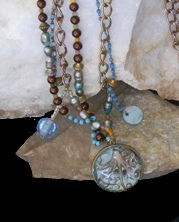 Steampunk necklace has multi-layers of beads, pearls and charms with unique illustrated octopus pendant. 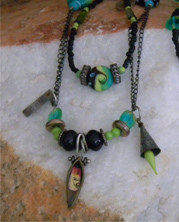 Industrial steampunk inspired green glass beads with industrial charms on chain. 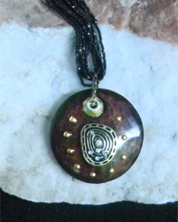 Metal pendant with charming embellishments, additional charms, beads and dangles. 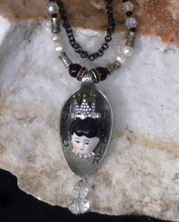 Victorian punk with Queen's head in a silver spoon! 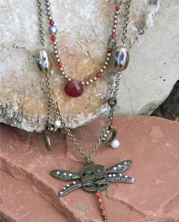 Steampunk dragonfly with crystals flirts around with charms, beads and chain. 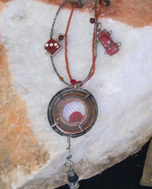 Czech glitter balls and beads complement this unique industrial charm set on a burgundy lucite oval. 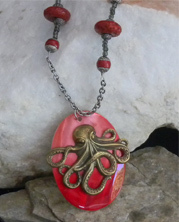 Steampunk gets nautical with bronze metal octopus on a bright red shell with coral beads and chain. 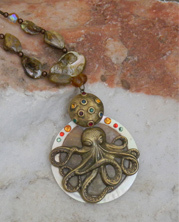 Lifelike octopus in motion on shell backing with chunky multicolored crystals and shells on strand. 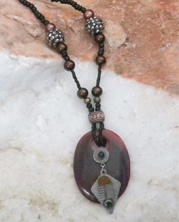 Artisan look dark wood pendant adorned with metalwork and crystals on multistrand of seedbeads.